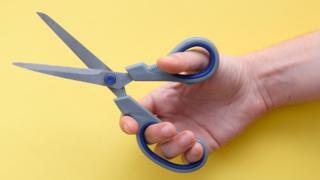 A man used a pair of scissors to threaten a shop customer during a robbery in Belfast, police have said. The incident happened on Woodstock Road in the east of the city at about 20:20 GMT on Saturday. The man demanded money from staff and made off with cash from the till. Police said the man was described as being in his late 20s or early 30s and was wearing a blue hooded top, grey track bottoms and a black scarf over his face. The suspect was reported to have been in the company of a pregnant woman earlier in the evening. She was wearing a cream coat and a pink scarf and had her blonde hair tied back. Detectives want anyone with information about the robbery to contact them.